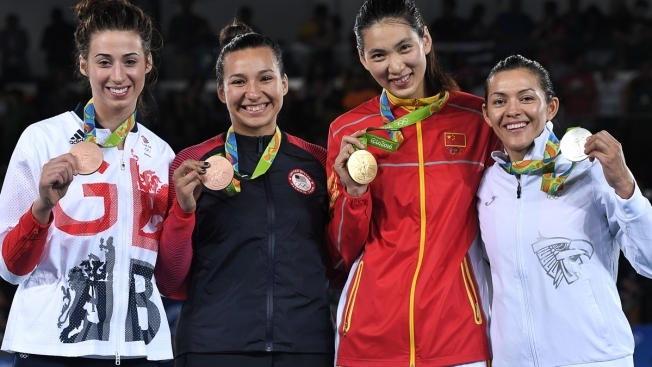 From left: Bronze medalists Great Britain's Bianca Walkden and American Jackie Galloway, gold medalist China's Zheng Shuyin and silver medalist Mexico's Maria Espinoza pose with their medals on the podium after the women's taekwondo event in the +67kg category at the Rio 2016 Olympic Games on Saturday, August 20, 2016. China's Zheng Shuyin won the women's taekwondo heavyweight gold medal after defeating world number one Maria Espinoza of Mexico in a slow-moving final where both fighters were on the defensive. Zheng defeated Espinoza 5-0. At times, both fighters appeared unwilling to spar and the referee penalized both for passivity. Zheng used her considerable height advantage over Espinoza — she is six inches taller — to block Espinoza's attempted jabs and to sneak in her own kicks. Espinoza previously won two Olympic medals: a gold at Beijing and bronze in London. Zheng's Olympic gold medal is China's second in taekwondo at the Rio Games; Zhao Shuai took the men's 58-kilogram division Wednesday. The women's bronze medals were won by Britain's Bianca Walkden and Jackie Galloway of the U.S.
On the men's side, third seed Abdoulrazak Issoufou of Niger couldn't defeat Azerbaijan's second-seeded Radik Isaev in the gold medal match. At six feet nine inches, Issoufou towered over all of his opponents and used his height advantage to land numerous head kicks on his rivals, including world number one Dimitry Shokin of Uzbekistan, whom he defeated out in the semifinal to roars from the partisan crowd. But Isaev had the initiative in the final, winning six points by attack while Issoufou only won two points, both by penalty. USA's Stephen Lambdin was eliminated during the first match in the +80kg heavyweight class. He lost to Brazil's Maicon de Andrade Siqueira 9-7.